Two weeks ago our modem died. Scott, my hubby, got another one from Radio Shack and tried to install it but that didn’t work. So we ordered a new one through our internet provider and they had to send it via UPS which meant we were without internet for several days. Which is why there was no post two weeks ago. Then as I was writing the post for last week, the computer shut down on me out of the blue and I already had such limited free time which was extremely scheduled and had no room for interruptions of this sort that I couldn’t bring myself around to spending more time on it just then. Life has gotten even more busy for our family over these past couple of months because of new things happening and I’m going to really try to keep up on this blog, but I may not be able to post as often as I’d originally planned; at least not for the time being. We’ll see how it goes. Now, on with the food post. 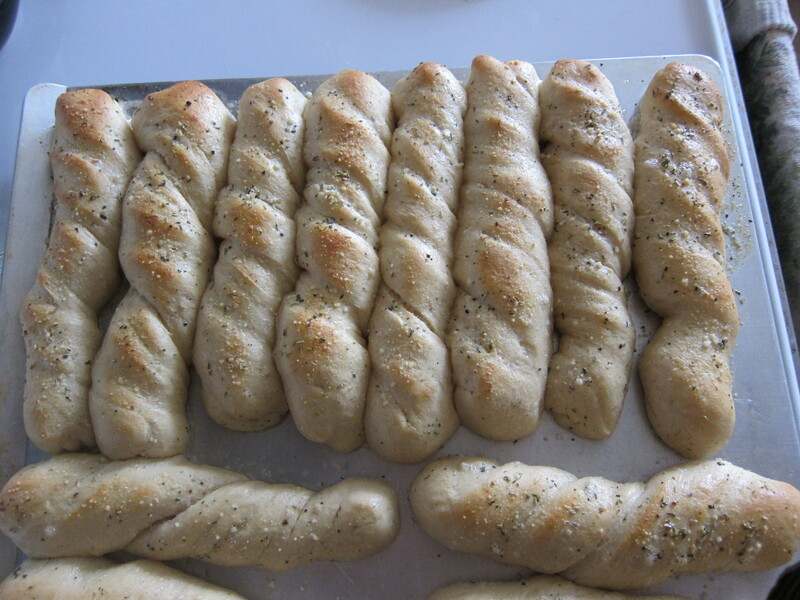 This is a favorite bread stick recipe that we make when we eat almost anything Italian: spaghetti, pasta, lasagna, etc. Over half of the flour is whole white wheat, and the rest is an unbleached, umbromated white flour(google what those words mean if you’re unsure). I learned about unbromated flour from Chef Brad. He’s an amazing chef on BYUtv who fuses grains with everyday foods. I love it! Anyway, it’s obviously better for you to use all whole white wheat flour, but when you do, the result is a denser, harder, wheatier bread which I just don’t enjoy as much in a bread stick. When you make it this way with whole wheat flour and unbromated flour you get a beautiful fluffy bread stick that your family will thank you for! Next I want to experiment with doing half whole wheat and half spelt flour. If any of you give that a try let me know how it turns out and I’ll do the same. 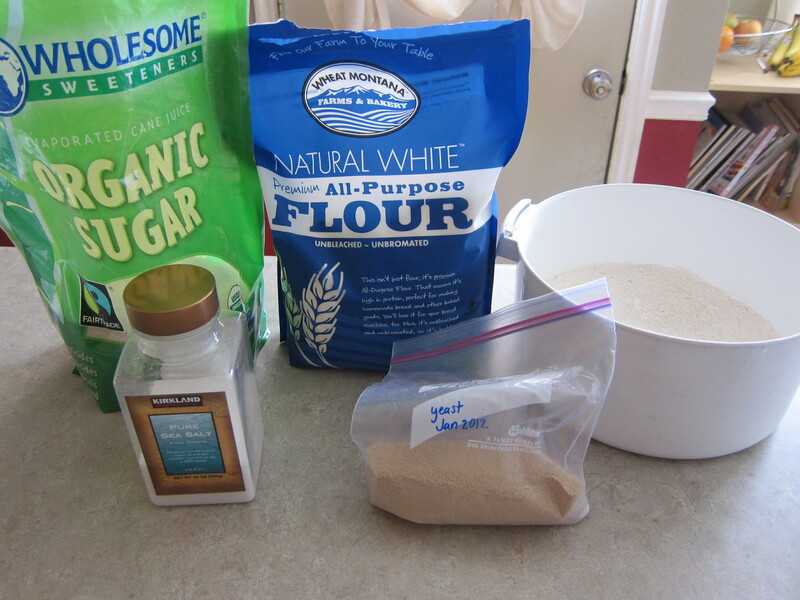 Pretty basic ingredients for the bread: flour, evaporated cane juice or other sugar, sea salt, yeast and warm water. Once you make the dough (I use my bosch and add only enough flour for the sides of the bowl to come clean, but still a little sticky to the touch), you’re going to put it in a greased bowl and let it rise for about 45 minutes; or you can put it in the oven with a pot of boiling hot water and shut the door and it’ll cut your rise time in half. Preheat your oven to 425 degrees. Roll out your dough on a lightly floured surface into a rectangular shape (probably around 10in wide x14 inches long or so). 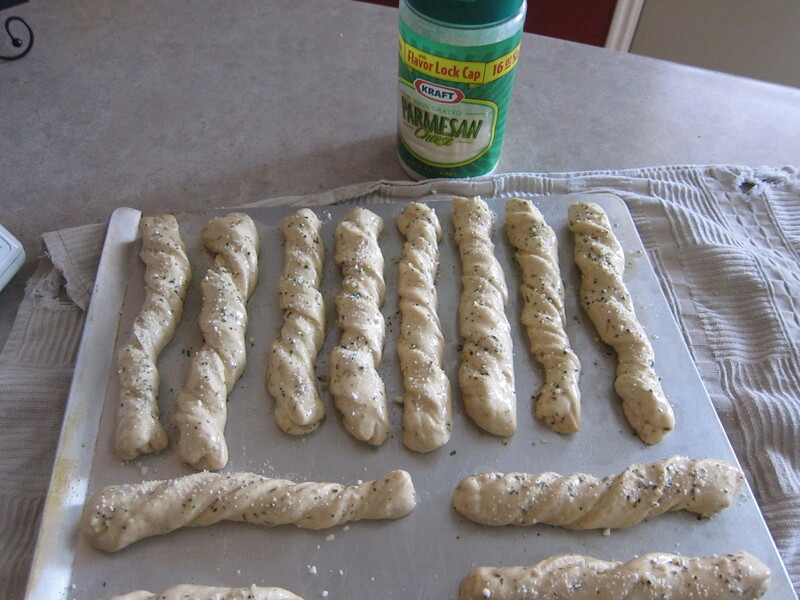 Using a pizza cutter, make 12 bread sticks. When you pull them off the counter they’ll stretch a little so I like to fold mine in half, pinch down where the ends meet and then twist them and lay them on a cookie sheet. 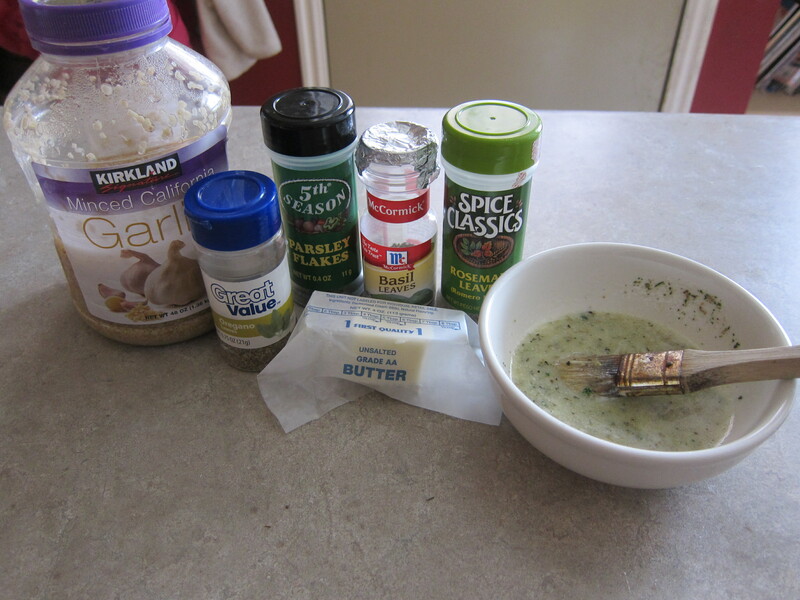 Brush this buttery, garlic mixture over the tops and sides and then sprinkle with a little Parmesan cheese. Add salt and stir. Add 1 1/2 c. flour and mix well. Gradually add more flour (usually between 3-4 cups) until dough starts to pull away from the sides of the bowl and it barely sticks to your finger. Preheat oven to 425 degrees. Remove from bowl and place on a lightly-floured surface. Spray a baking sheet with cooking spray. Roll into a rectangle and cut into 12 strips with a pizza cutter. 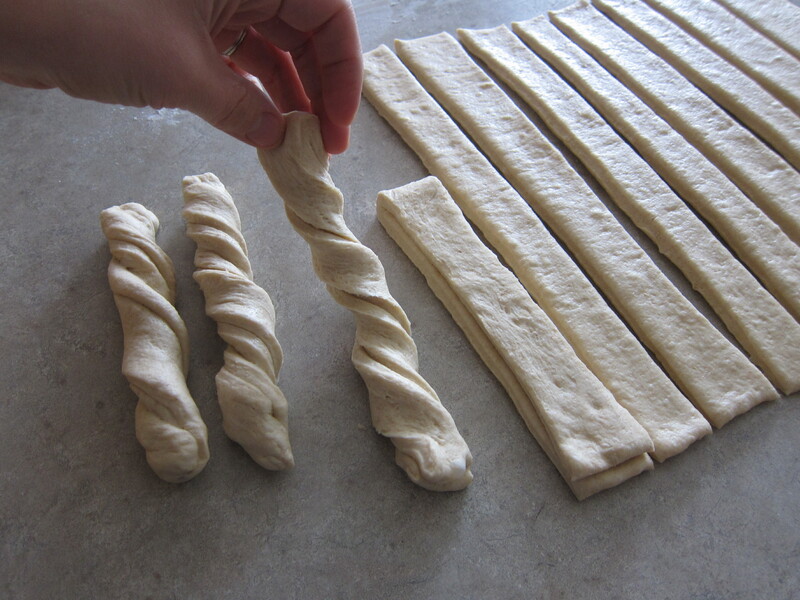 Fold each piece of dough in half and twist. Place on baking sheet and repeat with remaining 11 pieces of dough. Try to space them evenly. 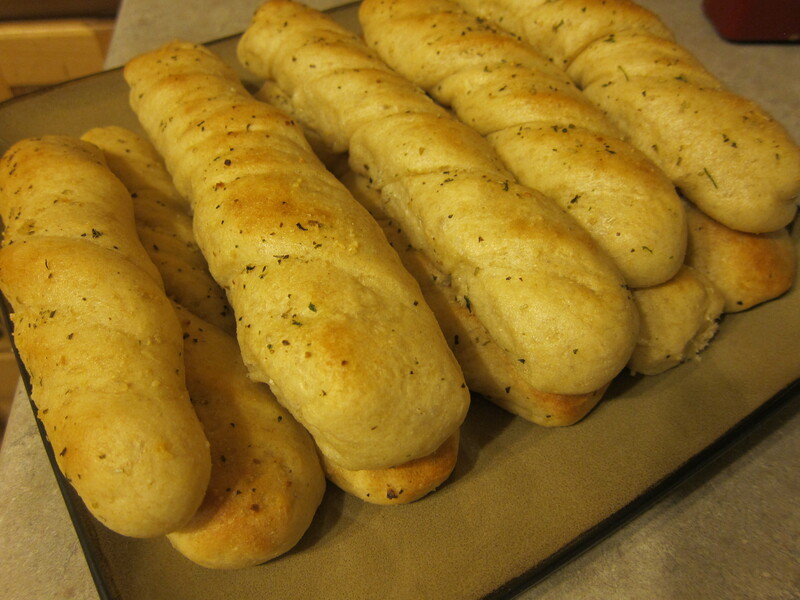 Rub over breadsticks. Bake for 10-12 minutes or until golden brown.